There’s something about pot roasts that just take me back to my childhood and coming in from a chilly fall day to the aroma of a juicy, tender roast in the oven. As a Weight Watchers member, I try to avoid red meat most of the time due to it being higher in Points and higher in cholesterol. But every now and then, I reward myself, and this Cabernet Beef Pot Roast Recipe is a perfect treat. The key in this dish is REALLY getting that roast trimmed of fat. I usually have the butcher trim it for me at the store, then I spend about 10 minutes going over it really well myself and trimming as much fat as possible. Occasionally, I’ll find some really good lean, pre-packaged ones at the store that don’t need trimming at all – like the one I used for this post. And the bonus is that the nutritional stats of the meat were on the label, so I was able to see how much fat was in the meat. The one I used had just 3.5g of fat per 4oz, which was AWESOME. The roast is seasoned and then braised in a red wine broth. It’s very simple, allowing for the true flavor of the beef to shine through. 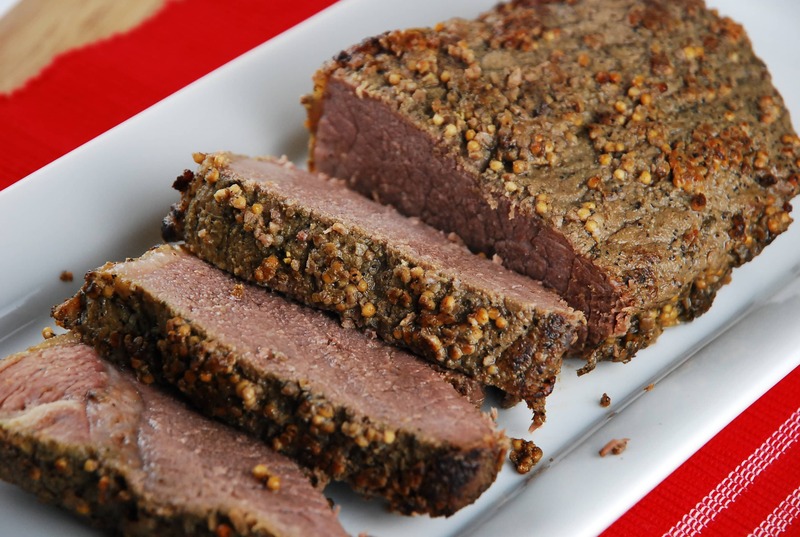 I’m thrilled to have found a healthy pot roast recipe that allows me to enjoy red meat more often! Moist, juicy, and wonderfully flavored, this Cabernet Pot Roast is a classically delicious meal. By trimming most of the fat from the beef, you’ll get a much lighter version of the traditional American meal. Preheat oven to 325 degrees and spray a small roasting pan with cooking spray or an olive oil mister. Melt butter in a medium, nonstick skillet set over medium high heat. Season roast on all sides with salt and pepper. Place roast in skillet and brown evenly on all sides. Remove from pan and place into prepared roasting pan and set aside. To the same pan that was used for browning the meat, add garlic and sauté until fragrant, about 1 minute. Add in wine, mustard seed, and thyme and stir, making sure to scrape up the browned bits on the bottom of the pan. Bring to a simmer, then remove from heat and our over roast. Cover roasting pan with aluminum foil. Place roast in oven, and cook for about 1 hour, or until internal temperature reaches 145 degrees. Let rest 10 minutes before slicing. Cut into 6 even slices and serve. Would there be a way to adapt this to a crockpot? I have the all in one crockpot where I can brown meet and cook in the same crock so as to not lose the flavor. If so, how long would it need to cook for on low? 6 hours? 8 hours?